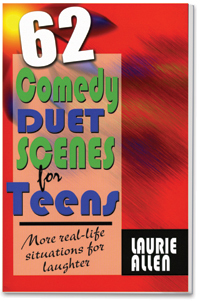 People just can’t get enough of Laurie Allen’s comedy duet scenes! Based on the popularity of her Sixty Comedy Duet Scenes for Teens, this sequel was inevitable. Like her original, this funny book is written for middle and high school students, with a brand new collection of five- to ten-minute skits split evenly between scenes for females, males, and mixed. Allen is a pro at capturing a teen’s voice, and many of her competition pieces have gone all the way to national speech and forensics competitions. Laurie Allen has done it again! Due to popular demand, she has created another book of short plays for teens, all fresh and original. Here’s more of Laurie Allen’s sketches for teens, ideal for classroom practice or contest use.